It is so cold this winter that the five Great Lakes are freezing over, joining Niagara Falls in a dramatic ice makeover. Lake Erie is nearly totally frozen and Lake Superior and Lake Huron aren’t far behind. Large swaths of Lake Michigan and Lake Ontario are also iced. 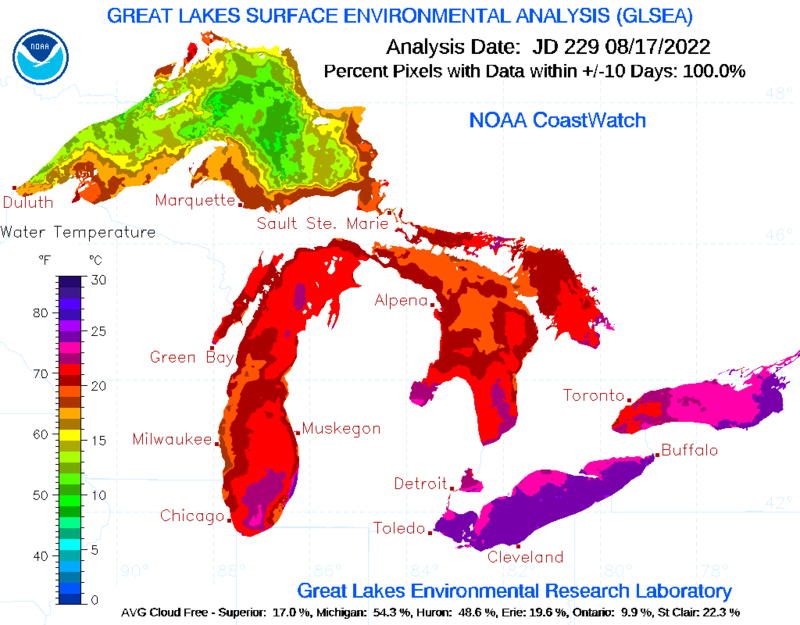 Overall, the National Oceanic and Atmospheric Administration’s Great Lakes Environmental Research Laboratory reported that 84.4% of the lakes were under ice cover. Last winter, freakishly cold weather caused record-setting levels of ice in four of the five Great Lakes, with 92.2% coverage by early March. The record for all lakes was set in 1979 with 94.7% ice coverage. Winter’s icy grip continued Monday with wind chills dropping across the upper Midwest and Northeast. The weather service predicted the chill in Bennington, Vt., could drop to 17 below zero, while Lake Placid, the upstate New York site of former Winter Olympic Games, could shiver at minus 30. The actual temperatures in Saginaw, Bay City and Midland, all in Michigan, fell to minus 10 degrees. Texas and the Deep South were hit with plunging temperatures about 25 degrees below normal and freezing rain, according to the National Weather Service. In the Northeast, where winter has been measured in feet of snow rather than inches, wind chills made life numbing for the unprepared. Very cold temperatures this month have resulted in a rapid increase in Great Lakes ice coverage. At 84.4% total ice coverage, this is the second highest percentage of ice on the Great Lakes since 1994. In Stephenville, Texas, freezing rain forced a delay in the murder trial of Eddie Ray Routh, charged with killing Navy SEAL Chris Kyle, the author of “American Sniper,” the basis of the popular movie of the same name, and Kyle’s friend, Chad Littlefield, two years ago. The trial was scheduled to resume Tuesday. Winter weather warnings, advisories and watches were in effect across the nation through parts of Oklahoma, Arkansas, Louisiana and Mississippi. More than 900 flights were canceled in and out of Dallas-Fort Worth International Airport. Becky White has lived in Niagara Falls, Canada, her whole life, and always likes to see the falls in the winter because the view is so clear. When she visited Friday morning, the view was different. Ice had formed not just at the base of the falls, but along the sides and on top. “A storm system and arctic cold front will bring winter weather to parts of the western and southern U.S. through Monday. Heavy snow will be possible across higher elevations from California into the Rockies. A wintry mix of snow, sleet, rain and freezing rain will be possible from New Mexico into the Gulf Coast states,” the National Weather Service reported. The snow made for difficult driving conditions along many highways in northern and eastern New Mexico, while Colorado's lawmakers were told to stay at home. Much needed winter rain hit Southern California on Sunday. A satellite image shows the extent of ice on the Great Lakes. Very cold temperatures this month have resulted in a rapid increase in Great Lakes ice coverage. An ice fisherman makes his way back to his car after fishing on Independence Lake in Whitmore Lake, Mich.